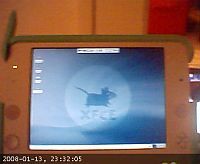 I finally went whole-hog and installed Xubuntu on my OLPC / XO laptop. I am too worn-out by the process to actually post screencaps or photos so I posted someone else's! Instructions that I followed are right HERE. I used the XO itself as the Linux box to create the SD card / format / partition it etc. I used my Mac G5 to download the torrent of the Hardy tarball and put it on a Fat32 USB drive. So, for those of you using the XO Laptop (the One Laptop Per Child Project), this might help you update cleanly. I wanted to upgrade to build 711, the latest stable release, but I didn't want all the kiddie / programming activities that come with the activity packs. I had some problems installing activities one at a time, and finally made Web 86 work after installing Firefox and Browse, both of which failed to start and seemed to prevent me from installing Web at first.